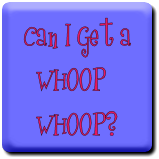 Friday has rolled around once again, and you know what that means - - - it's time to get our whoop whoop on! Time to share our week's accomplishments and do a little happy dance! So let's get started! This week I've been working madly on projects using Joel Dewberry's new fabric line, Modernist, that will be revealed on Monday - but I've got one I want to share with you today! This boy REALLY loves green - it's the color of the Teenage Mutant Ninja Turtles, his favorite cartoon. This was the perfect fabric for his shirt! A quick face cleaning by mom before his pictures... then he was so excited about his new shirt and having his picture made, he started jumping up and down!! I'd say that's a pretty happy kid!! So - - - can we get a whoop whoop?? What's making you dance a little happy dance? PS - remember to come back on Sunday and sign up to participate in this year's Hands2Help Charity Quilt Challenge! There will be a giveaway open to all the people who have signed up by next Saturday, 3/18, at noon CST, so don't miss your chance! It made me smile to see your grandson's joy with his new shirt. I don't like making buttonholes either. I did a fairly good job on my "old, old" Elna. I love my new Elna, but I hate the way buttonholes are made with the new machines. He looks so handsome in his new shirt. What a happy young man. He looks so handsome in his new shirt. I love the shirt, and he is such a cutie! That shirt looks awesome! I need an easy pattern to make one for each of my grandsons!!! "Amen" on the buttonholes for sure! It's been so long since I made buttonholes, I'm not sure I could do it. I LOVE the pics of Nathanael in motion. So fun! I don't sweat button holes - lucky to have a machine that handles them nicely. He does look like on HAPPY boy and love that geo design! Super matching those directionals! Oh Sarah! I'm so sorry! I had trouble pulling up a photo and then it posted three times! Can't find a way to delete two of them. Your posts are always sooo encouraging! This little guy is sooooo cute! Look at that smile! Remember when things like a new shirt would make you that happy? I don't mind making the buttonholes...but you have to sew on the buttons--and the recipient expects them to like up with the buttonholes. Sigh! You can totally get an Amen! Buttonholes are disgusting creatures. ;D Cute shirt! I love how excited he is with his shirt. Way to go!! The color and design are fantastic. I find buttonholes scary. My buttonholer is a featherweight Singer attachment that moves the fabric in a zigzag motion. I used to use it all the time, but haven't had the courage in years. Nathanael's shirt looks awesome! He's is one happy little guy. I love his shirt!! And he is so awesome!! Hands2Help - Tips, Tutes, and Tasty Things!! Make-A-List Monday - Making Headway!! Hands2Help - And We Have A Winner! Make-A-List Monday - the Tuesday Edition!! Hands2Help - Time To Sign Up! And A Giveaway!! Make-A-List Monday - Diggin' Out and Diggin' In! Stunning Stars #6 - "A Star Is Born"!